This open walk starts at the source of the River Yarrow and takes you across wild, open moorland to historic Spitler’s Edge with links to the ancient Knights Hospitallers. This walk is one for a fair day for sure! Distance: 3.25 miles. Download GPX. The walks starts at the source of the River Yarrow. The parking spot is on the high point of the Rivington to Belmont road. There are refreshments at either end of this link road – the Chapel House tea room at the Rivington end, and the Black Dog Inn at the other. Despite it’s name, the latter didn’t permit dogs at last visiting. 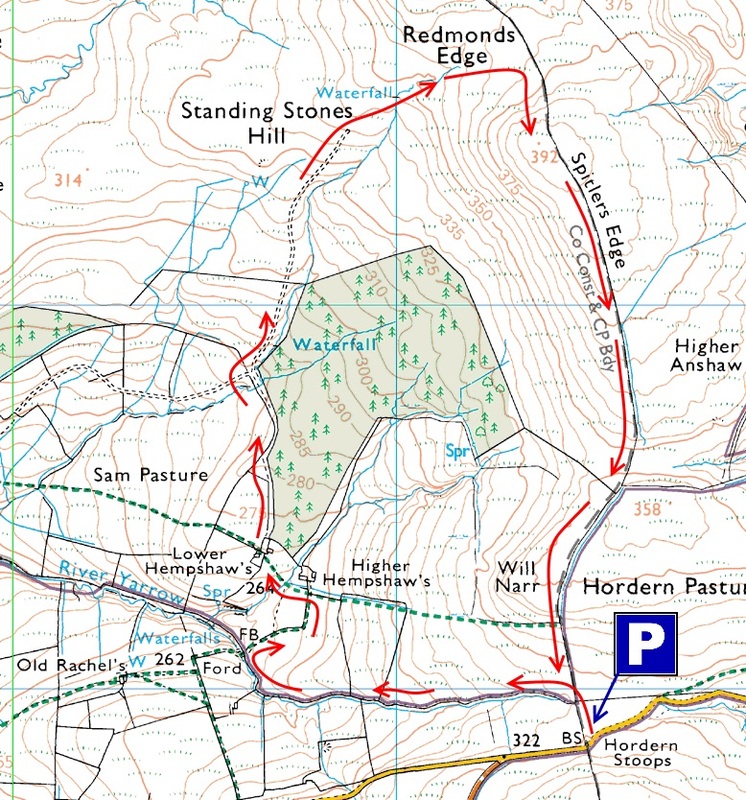 Once parked up, walk towards the hill that leads away from Winter Hill mast, which should be behind you. When you come to the first gate, you may have water beneath your feet, or not. This is the moving source of the River Yarrow, and you should turn left here to follow the infant brook downstream. This can be a bit of a hop and a jump at times, with this being an Open Access path rather than a green right of way. At a crook in the river, the path turns gently right and after a short way meets the official right of way at a stile, where there is a bridge over a waterfall. If you wanted a short detour to the ruins of Old Rachel’s, you could cross the river, but instead turn right and follow the track through the two ruins of Hempshaw’s. The track that joins the two ruins is used by the local farmer for tending to his sheep, so whilst it is not the “official” footpath, it is a permitted route and is the best path underfoot. Follow this all the way around the moorland edge until you reach a fork. Turn right here and head uphill, by the side of Standing Stones Hill and on to Redmond’s Edge. As the path peters out, the ground can get boggy, but the direction is clear. Once you reach the “edge” you will meet the main path between Hordern Stoops and Great Hill, and you will have to turn one way or the other here, as there is a dividing fence and wall separating the parish boundaries. Turn right and you are walking along Spitler’s Edge, which is named after the Knights Hospitallers Of St. John Of Jerusalem who used to use this route. Follow this path downhill to your start point.